Rally driver Becky Kirvan will end her 2011 season by competing at the very top of the rallying ladder when she contests Britain’s round of the World Rally Championship, Wales Rally GB. East Yorkshire-based Becky has enjoyed a successful year competing in the BRC Challenge in her Ford Fiesta ST car with co-driver Kaz Watts and she has secured a deal with world-leading chemical company Cristal Global which will enable her to contest the world championship event once her BRC Challenge campaign is complete. Cristal Global, who have a plant in Stallingborough, employs nearly 4,000 people on five continents and they are the second largest titanium dioxide producer in the world, the largest producer of merchant titanium chemicals and the leading manufacturer of specialty titanium products. Fahad Nackshabandi, General Manager of Cristal Global Corporate Communications commented: "We are pleased to support Becky on this event, she has done very well in rallying and we are proud to help her compete at the highest level possible." Rally GB will consist of four days of competition all over Wales starting on the North coast near Llandudno and finishing in Cardiff. The total competitive mileage is 220 which is over three times longer than any other rally Becky has contested up to now. Becky presently lies in 7th place in the BRC Challenge as well as second in her class championship and she still has three rounds to complete before her Rally GB outing with events in Yorkshire followed by a double-header on the Isle of Man. 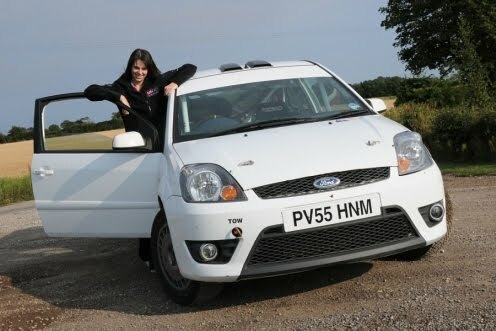 Please visit www.beckykirvan.co.uk or www.facebook.com/BeckyKirvanRallying to find out more about Becky’s rallying.